When Chef Tyna was a child, she was a very picky eater, and her mother always told her to not play with her food. Now that’s just what she does. She showed her mom that it’s okay to play with her food. We started making our signature sauces to sell in 2002 shortly after Tyna Mays-Schey graduated from culinary school. Her first chef job was in a bbq restaurant where they made their own. After she left, she took what she learned and started making her own version for family and friends. Her signature bbq sauce then was Honey Habenero, and they were hooked. Another sauce that she started making in her line began when she was 11. That was her Attitude dipping sauce. It all began when she was trying to recreate her favorite condiment, A-1. She grew up in SE Portland, and when her father lost his job, times were tough. Her favorite sauce for food was A-1 but it was very expensive, so she started playing with all the condiments she could find in the fridge. And over the years it has been tweaked, adjusted, and then perfected, to the award-winning sauce it is today. When we started, we were operating under the name Every Day Gourmet, but our sales were very low. After meeting with a consultant, the first thing they told us was, our name sucked. So, shortly after that we rebranded it to Saucy Minx BBQ. We kept Every Day Gourmet LLC, but are doing business as Saucy Minx BBQ. Since its rebranding under the new name, sales have grown by leaps and bounds each year. Tyna’s biggest supporter for building the business has been her husband Ken. She met him when they worked together for an ambulance company 24 years ago. They have been married 23 years, have 3 boys, and have been true partners since. 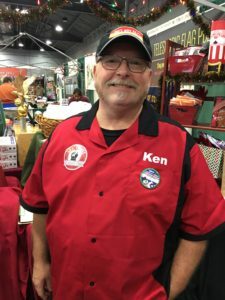 Ken has encouraged, funded, and has been the set up and take down guy at her events, all while, working nonstop on the ambulance for the past 25 years as a paramedic, despite having some health issues. 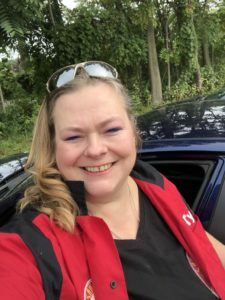 One of Tyna’s goals is to make it so Ken can take it easy, and not work so much. Our sauces can currently be found in 6 retailers, one of which has 12 stores. Tyna is working hard on getting into more retailers, and even restaurants. You can find a selection of sauces used in recipes at Brickyard Public House in Gresham, and recently we were featured on pizza at Hood Crest Winery in Hood River Oregon.